As one of the most popular fiber optic probes offered by Guided Wave, the SST has been commercially available for over 25 years, making this product the most widely copied probe design in the industry. 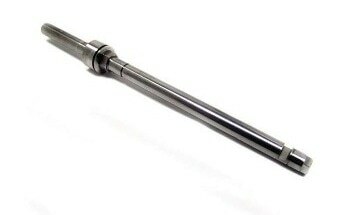 As a highly rugged and reliable option that can be easily installed within a pipe or reactor through a single access port, the SST probe is ideal for continuous process monitoring applications. Additionally, the SST Probe is compatible with any Guided Wave analyzer and many other analyzer brands. The SST probe can be made to accompany a wide a variety of optional accessories that allow for it to easily adapt to applications in different types of process installations. The SST probe houses both incoming and outgoing optical-fibers side-by-side in a single 3/4-inch, or 1-inch stainless steel body (U.S. Patent #6,043,895), thereby allowing true transmission rates to be analyzed and ultimately provide users an improved signal, reduced noise and overall better measurements. However, for extremely corrosive process streams, it is recommended that the O-Ring SST Probe is used instead. Provides protection of the probe against hydrocarbons and polymers. The probe, or sample interface, plays a crucial role within the complete analyzer system. To ensure the highest optimal performance, it is imperative that the probe is optically matched with both the spectrometer and optical fiber that is used to transmit the spectral signal. Similar to all other Guided Wave’s optical probes, the SST Probe is also matched to all Guided Wave analyzers and fibers to ensure that the highest possible performance is achieved. It is also important to note that Guided Wave probes are also capable of working with numerous other fiber optic analyzers of varying diameter and spectral ranges which are produced by different manufacturers. The SST probe can be made available with various optional accessories that allow for the probe to easily adapt to numerous different types of process installations. For example, the Extractor Assembly Mechanism allows for a rapid and easy removal and servicing of probes without requiring the process to come to a halt. Additionally, Guided Wave’s custom flange service facilitates the easy installation of the SST Probe into common process pipe configurations. Guided Wave offers a wide variety of probes, flow cells and fiber optic cables that are capable of meeting the harsh demands of the process environment. In fact, these options are often equipped with various auxiliary features, all of which remain compatible with all Guided Wave analyzers, as well as several other fiber optic based analyzers that are manufactured by other companies. Most of Guided Wave’s probes and flow cells can be optimized for the UV, visible or NIR spectral regions, or even supplied with custom fiber diameters and connectors to meet the specific optical requirements for each customer’s purpose. Note that if Guided Wave does not offer a specific probe or flow cell that is required for a customer’s purpose, this company will specifically design a custom solution to meet a particular process installation.